By 1985, just 3 years after she had relocated to Southern California from Minnesota, Ngoc Lan had managed to make a name for herself in the Vietnamese pop music industry. From her very first professional recording which was of a song written by Le Minh Bang entitled, Lo Mai Sau (Come What May) produced and released under the music label, Da Lan, her soothing, gentle singing voice quickly caught the attention of various music producers of different Vietnamese music production labels. The fact that she had been blessed with having perfect pitch in her singing voice made her flawless deliveries in the recording studio seem effortless. Soon after, Ngoc Lan's infectious style of singing would also make its way into the hearts of the general Vietnamese audience. By the mid 1980s, Ngoc Lan's childhood dreams of one day becoming a professional singer had finally become a reality. With a full schedule consisting of her numerous collaborations recording for various major Vietnamese music labels of the day such as Asia Productions, Kim Ngan, Lang Van, etc. along with her steady gig as a contracted regular performer at Ritz nightclub in Anaheim, California and a steadily increasing demand from booking agents for her to perform on live shows for Vietnamese communities throughout the United States and abroad, Ngoc Lan was finally able to earn a living as a full-time professional Vietnamese singer. Although she had established herself as a singer whose name had gained familiarity in the Vietnamese pop music industry with her recorded songs appearing on numerous compilation albums of different music labels, Ngoc Lan was still one step away from being a star. The vehicle that was needed in order to solidify her stardom would naturally be a debut solo album of her own. Prior to the release of her debut album, the positive feedback and warm receptions Ngoc Lan's recordings were given proved as strong indicators in Ngoc Lan's potential as a bankable artist in the Vietnamese pop music industry. This factor would become clearer and clearer as her popularity and fanbase of followers grew. At least a dozen different music producers of various different Vietnamese music labels had approached Ngoc Lan with offers to produce her debut solo album since she first appeared onto the Vietnamese pop music scene. But they would all get turned down by Ngoc Lan. From even her early days of her singing career, Ngoc Lan had earned a reputation of being a perfectionist. Staying true to her reputation for being a perfectionist, Ngoc Lan insisted on having complete artistic control for her debut solo album. This would be the reason for Ngoc Lan's rejection to such offers from several different music labels, prompting her ultimately to make the decision in producing her first solo album herself. After much delay, finally her self-entitled debut solo album which she was also producer, Tieng Hat Ngoc Lan would be released in 1986 by Ngoc Lan herself. Ngoc Lan's debut album would consist of a combination of primarily French and Vietnamese love songs. Ngoc Lan was well aware of the fact that a huge number of her fans she had acquired in recent years had really taken a strong liking for her recordings of songs in the French language. Ngoc Lan has reportedly said that she went with her instincts and thought that she would find her niche with French love songs. To Ngoc Lan's delight, her calculations were accurate. For many of her die hard fans, the release of her debut album in 1986 had been long awaited and couldn't have come soon enough. These same fans in turn, after hearing the finished product of her debut album, would share with the consensus that it was well worth the wait. The album was a huge success, both commercially and critically. Ngoc Lan was finally a star. 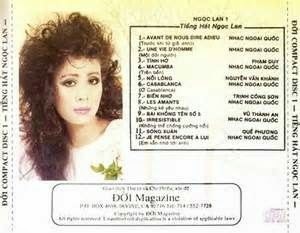 Two years after Tieng Hat Ngoc Lan had been released on audio cassette, Ngoc Lan decided to sell the rights to Doi Magazine that would re-release the album available in the form of compact disc. In the years that followed, Ngoc Lan's career would reach even higher heights, elevating her from stardom to superstardom. She would be in such high demand, as Vietnamese audiences everywhere couldn't get enough of Ngoc Lan. Swamped with bookings from all over the world, her busy schedule would entail extensive travels weekend after weekend to faraway destinations to perform at live shows. At her peak, her performing schedule left her so heavily booked, at times she had to be notified well in advance as early as 2 years prior to the actual date of performance for availability. Ngoc Lan would be one of the very few Vietnamese singers then who could afford not to be contracted as a regular performer with any local Vietnamese nightclub, as her busy touring schedule would not permit her the time to do so anyway. During a time when most Vietnamese singers would jump at the opportunity to be under contract as a regular performer for any of the 3 major Vietnamese nightclubs in Orange County; the Majestic, Diamond Nightclub, and of course, Ritz Nightclub, Ngoc Lan was always trying to avoid being bombarded with such offers. Ngoc Lan's next 2 solo albums would be even bigger successes. Le Ba Chu, the owner of the label known as Giang Ngoc, had managed to sign Ngoc Lan with a lucrative 2 albums deal that would make her the highest paid Vietnamese recording artist during that time. Ngoc Lan's 2nd and 3rd albums, Nguoi Yeu Dau (My Precious Love) and L'amour Tinh Ta (Our Love), released under the Giang Ngoc label in the years of 1987 and 1988 under the Giang Ngoc label, respectively. As it turns out, this record deal from Giang Ngoc label for Ngoc Lan, was a smart business move. According to Le Ba Chu, both of Ngoc Lan's solo albums produced under his label would end up as the label's the top selling albums of the year. It would be reported in 1992, 5 years after the initial release Ngoc Lan's 2nd solo album, Nguoi Yeu Dau, had been reprinted a total of 8 times with duplications of audio cassettes and was then reprinted for the 5th time with duplications of compact discs making it then the best selling ever Vietnamese pop music album that had been produced in the United States. After the enormous success of 2 consecutive bestsellers on her 2nd and 3rd released solo studio albums, Ngoc Lan was now an even bigger star whose recent accomplishments really seemed extremely hard to match and even impossible to surpass. Much to everyone's surprise, what was in store for Ngoc Lan's career in the upcoming future would take her to even higher grounds. 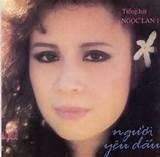 Ngoc Lan, who had become a star in the latter part of the 1980s, would enter the new decade in 1990 as a superstar.